After having fallen prey to Western machinations of destabilization and civil war, it is apparent that there may now be irreparable differences between the East and West portions of Ukraine. With the East of Ukraine more in line with Russia and the West more in line with Western Europe, all compounded by years of civil war and outright persecution and atrocities committed by the fascist Ukrainian forces, the DPR and LPR are showing signs of going their separate ways and breaking away from West Ukraine in a more final fashion. When Crimea voted to reunite with Russia after a long separation, many suspected the DPR and LPR would follow suit. In fact, there was a movement within both republics to do the same. However, geopolitical and diplomatic concerns on the part of Russia prevented such a vote from ever solidifying a “reunification” with Russia. A vote to reunify with Russia in the same fashion as Crimea would have no doubt caused a diplomatic emergency between Russia and the warmongering West. Indeed, it may have even caused military confrontation. However, after time passed and the impasse between East and West Ukraine has become more pronounced, it appears that East Ukraine is making moves toward becoming its own country even without formal recognition. East Ukraine – DPR and LPR (Donbass)– may very well become their own nation by default and by natural progression of events. Eastern Ukraine (Donbass) has, for at least a year, begun working on setting up the framework of a governmental system, complete with a political framework, the seizing of banks, and the operation of various industries. Greater centralized military structure, as necessitated by the current conflict, has also become a reality. Ironically, it appears Donbass is more so on its way to becoming its own independent country as a result of the actions of the fascists of East Ukraine than perhaps it would have been if simple neutrality and peace would have been observed by Kiev. 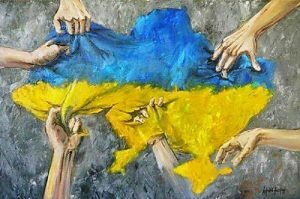 Every act of force by Kiev has served to push Donbass further and further away from Ukraine and more toward independence. These acts of force are also pushing Donbass toward greater cooperation with Russia, whose involvement in Crimea, political opposition to Western destabilization, and involvement in East Ukraine (still vociferously denied by the Kremlin) is the only reason Western forces did not simply roll over separatists and establish NATO bases on Russia’s border in 2014. In February, in a possible message to the West and a probable step forward in supporting the independence if not the “reunification” with Russia, President Vladimir Putin announced that Russia would be recognizing all “administrative acts” coming from the People’s Republics of Donetsk and Lugansk. These administrative acts include the issuance of IDs, passports, and other personal documents. While not an official recognition of the DPR/LPR governments, this announcement is obviously a step in that direction. East Ukraine has been under what amounts to an economic blockade since early in the conflict which began in 2014. However, Kiev stepped up the pressure recently by allowing fascist activists from preventing coal produced in West Ukraine from entering East Ukraine, thus preventing Eastern communities from a vital source of income. Donbass is now under a full economic and transportation blockade which Russia has repeatedly called for an end to. On March 1, the Donbass Republics essentially nationalized over 40 types of “enterprises” or industries. These enterprises range from large-scale to mid-range. This essentially broke up much of the economic power wielded by Ukrainian oligarchs, particularly Rinat Akhmetov, Ukraine’s richest man. The nationalization was also inspired as a result of Kiev having backed out of a deal that would have seen the businesses that were seized pay taxes to Kiev while Kiev continued to pay pensions and other social benefits to residents of the Donbass Republics. However, Kiev eventually stopped paying those pensions and froze the bank accounts of Donbass residents. Thus, Donbass was presented with the impetus for seizing the enterprises as they were essentially funding the war against their own territory by allowing the oligarch-owned businesses to pay taxes to Kiev. There were also concerns related to oligarchy as a concept but, more acutely, oligarchical influence in the DPR and LPR itself by virtue of the financial influence held by the oligarchs whose businesses were seized. “It will be in place until the occupiers return stolen Ukrainian industry to Ukrainian jurisdiction,” Ukrainian President Petro Poroshenko told the country’s national security council in Kyiv. Donbass activists and representatives are claiming that the blockade is revealing tensions inside Western Ukraine between Poroshenko’s government and the fascist forces continuing to provoke hostilities. However, at the end of the day, Poroshenko’s government and the fascists on the ground appear to be on the same page now that the blockade has been codified and legitimized by Kiev. The Donbass separatists, however, appear unfazed. 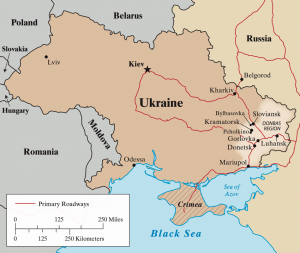 “Kiev can do whatever it wants on its side of the demarcation line. We don’t care. We aren’t changing our position,” said Alexander Zackharchenko, separatist leader. Yet, while the blockade of the shipments of coal was designed to boycott and break the backs of the people of Donbass, the blockade is a double-edged sword, since East Ukrainians will also be deprived of much-needed coal to heat themselves. But it seems Donbass has gotten around the Kiev boycott by finding another market for their coal – Russia, leaving Kiev literally in the cold to live with the consequences of their blockade. Zachkarchenko announced on March 14 that Donbass had shipped 90 wagon loads of coal to Russia, a claim that a Russian spokesman would neither confirm nor deny. Dmitry Peskov, spokesman for the Kremlin, would only say that Russia was attempting to “relieve the suffering of the people” in Ukraine. Ukrainian Prime Minister Volodymyr Groysman stated in early March that Ukraine was losing $73-147 million per month due to the trade blockade and stated that the coal shortage that has resulted from the blockade is damaging the metallurgy industry and serving to further cripple the Ukrainian economy. Russia has also called for an end to the blockade and labeled Kiev’s actions as standing in opposition to all common sense. But now that Donbass has found another trading partner, it appears that Kiev and the powers that back it have made a strategic miscalculation to say the least. Indeed, it appears that with each act of aggression on the part of Kiev and the West, Donbass is not frightened back into subservience but, quite the opposite, it is being pushed further and further away both into the Russian orbit and into independence. The Biggest Threat to World Peace Is NATO – How Much Time Is Left?